April's showers had me thinking purely of flowers, which meant I hightailed it to HomeGoods to pick up several pots for our deck and began planting basil, rosemary, mint (anyone want a watermelon mojito?! ), dill, parsley, lavender, red lantana, pink and white petunias, and a bunch of other flowers with names I'll never know. A couple months ago, I went on another green bender. I bought a handful of house plants, and peppered them around the living room and kitchen. It wasn't long after until the leaves started to shrivel because yours truly used pots that didn't have a drain hole (d'oh!!!) and we experienced a Biblical plague of flies that infested the soil and, consequently, our house. It was then that my sweet and patient husband banned me from bringing in live plants from the house. Since the great bug fiasco, I've mostly kept to my promise to keep the greenery in the casa artificial. However, our surviving snake plant was looking super lonely so I decided to sneak some cacti friends into the house to keep it company. I mean, it's pretty dang tough to kill a cactus, they are watered so infrequently that bugs are few and far between, and they are just so stinkin' adorable in their little DIY pots. Wouldn't these make a cute little housewarming gift set? 1. 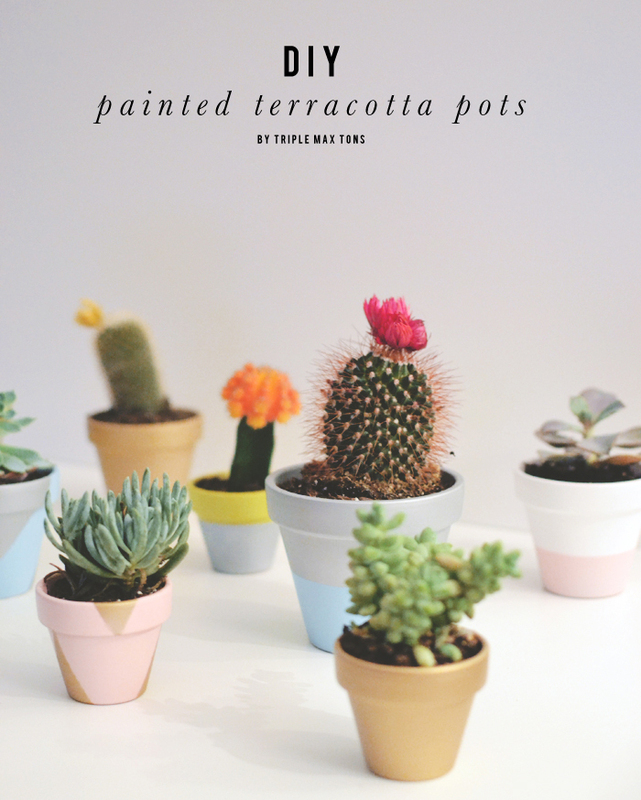 Pick up a variety of terracotta pots and spray paint them with a primer. Let thoroughly dry. 2. Spray on 1 - 2 layers of your base coat of color. Let thoroughly dry. 3. If you want to add designs like I did, use painters tape to form the design and tape off the rest of the space you don't want painted. Add your contrasting color, and let thoroughly dry. Note: the blue painter's tape is total crap, don't ever buy that junk....green Frog Tape is where it's at. 4. Spray on a layer of protective clear coat to make sure it won't chip off when you go to plant and water your plants. 5. 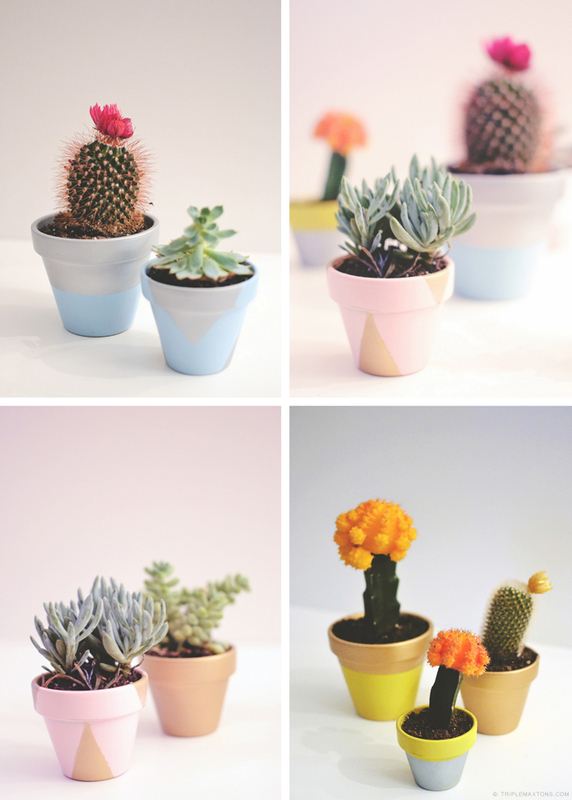 Plant your succulents and cacti, and set them on tables or bookshelves. Tip: For doing the color block pots, you can pretty much only get a straight line going across the wider portion of the pot, so you'll have to apply the contrasting color to the top portion only. Just something to keep in mind when painting your base and contrast colors. Love the pots and yes, I would like a watermelon mojito.